A fun twist on pancakes: These Blueberry Coconut Pancakes are made with coconut milk and topped with coconut whipped cream! Fresh berries seem to be all the rage right now. Many of them are in season right now. In Florida, our Strawberries are in season in February but even now, you can sometimes get a good package of California strawberries. You may have to dig around, or pay an arm and a leg for the organic strawberries, but you can still find good strawberries during July in Florida. But enough about strawberries. Today we are talking about blueberries. 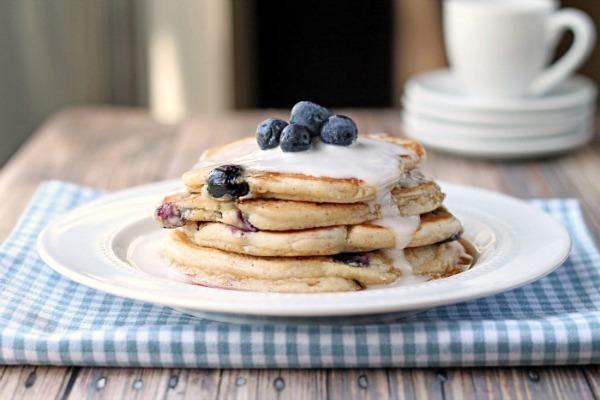 Fresh blueberry pancakes made with coconut milk. Ah yes, they are pretty amazing. I topped these with syrup and coconut whipped cream. As you can see, the whipped cream sorta melted. But it actually looks really cool drizzling down the slope of pancakes, doesn’t it? To make this recipe, I used my basic pancake recipe. I just subbed the milk with coconut milk. And I added a whole bunch of delicious, fresh blueberries to the pancake batter. It was oh so delicious. What are your favorite items to add to pancake batter? Whew, it has been one busy week. With school, work and blogging and more blogging (did I mention blogging?) I’ve been one busy gal, once again. Did I tell you I was going to Atlanta next month? I’m going there for 3 days for training for work. I’m not looking forward to flying but I am looking forward to checking out the Atlanta area. We’ve been talking about the idea of moving out of state sometime after I graduate next year. Ken got CCNP certified last month, which puts him in line for some great job opportunities. Right now it’s just talk. You know how people love to talk about the future and what dreams and goals they have, right? If we moved though, I’d definitely miss the beaches. I grew up 45 minutes from the beach and now I live only 10 minutes from the beach. Needless to say, but I will, I love the beach. 1 can of chilled coconut milk, solid part only, discard the thin liquid. In a mixing bowl, combine the flour, 1 tbsp sugar, cornmeal, baking powder, salt and cinnamon. In another mixing bowl, whisk together the egg, coconut milk and oil. Add the wet ingredients to the dry ingredients and then mix in the blueberries. Cook on a non stick pan over medium to medium high heat for about 2-3 minute per side. Serve with syrup and coconut whipped cream. Beat together the coconut milk solids, vanilla and sugars until it thickens and forms light peaks. Makes approximately 12 pancakes, depending on how much batter you use for each pancake. Nutrition information is for pancakes only. Condiments such as syrup and the coconut whipped cream will alter nutrition content. So what do you think? Will you give the Blueberry Coconut Pancakes a try? These sound delicious, I bet the flavor from the coconut milk is great in these pancakes and love that you added cinnamon to the batter as well. Definitely need to try these. Pinning! Thank you, Krista! The coconut milk was wonderful! The pancakes were denser. I loved the. They kind of reminded me of the taste of a muffin! I hope you enjoy them! Blueberry pancakes are my absolute favorite but blueberry AND coconut sounds even better. Also perfect because I never have seem to have milk in the house and always have coconut milk. Thanks for this! You’re welcome, Andj! I too sometimes only have coconut milk in my house! I have to try using coconut milk in my pancakes! Sound delicious July. 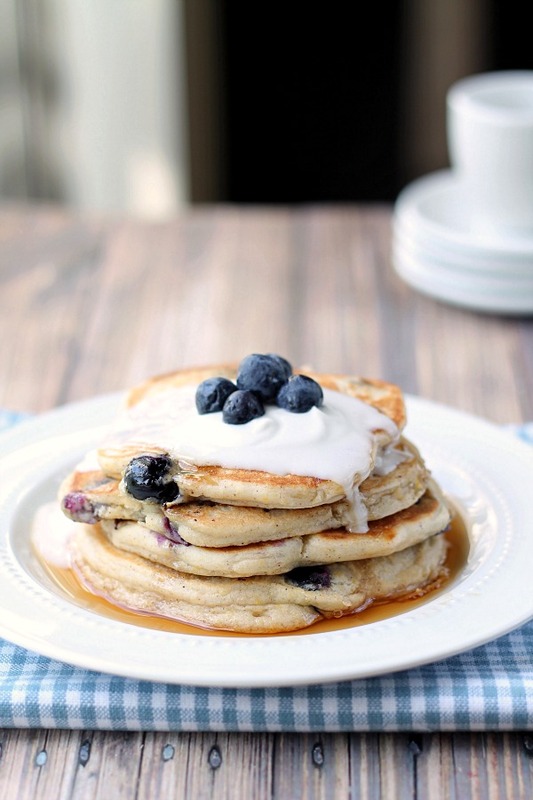 I love blueberry pancakes and would never have thought to pair them with coconut! Wonderful pictures too. Your site is looking good! Thank you, Zainab! Yea, the beaches in Florida are awesome! East coast and west coast are both nice. I love the beach and the atmosphere of a coastal community so I don’t know if I would really want to move but I have an urge to explore other areas of the country. Seriously, I could be one of those people who lives somewhere for 2 years and then goes on to a new place! I put coconut in everything so I looooooooooove these. These pancakes look to die for!! I am on a huge blueberry kick right now so I’m definitely going to have to try these! We live about 10 minutes from the beach now and every once in awhile talk about moving somewhere cheaper but I would be so sad to live further from the beach! Sounds like you are one busy girl, keep up the good work – your blog is fantastic!!! Have a great day! I love living near the beach. It’s great. But part of me wants to explore other areas of the country! I love pancakes. Last weekend at home I made them for the first time in years. Pinning this for the next time I’m pancakes inspired! Thank you, Anne! It’s a wonderful combination! Coconut whipped cream!! serious yums! Not only will I give this a try, I think we need to have breakfast for dinner in our house! Yum! I love having breakfast for dinner! I hope you enjoy them! I’ll have to try these soon with Saskatoon berries! They look so lovely! Dear Julie, these pancakes sound like a wonderful morning treat!! …I can’t decide which I would rather wake up to these, the french toast or the white chocolate pancakes! I’d be happy with either! Thank you so much, Catherine! You could make a recipe for each morning of the week! Well, you’d have three days down. :) Thank you so much for stopping by and welcome! Julie, these pancakes look fantastic, wow! Pinning and buffering! The whipped cream actually looks pretty perfect running down the sides! You’ll enjoy exploring Atlanta and try not to let the idea of flying overwhelm you. It’s always a little scary to think about making big life changes, though my philosophy has always been go for it and try. If it doesn’t make you happen, you can always change it again! Yum, these look awesome and I love coconut! Pinned and sharing on FB – hope you are having a good night! Love it! another great recipe Julie, thanks for sharing! You’re welcome, Paula! Thank you for stopping by! Leave it to you too take blueberry pancakes to a whole new level! Here in Michigan blueberries are just coming into season, so this recipe is perfect timing for me. Can’t wait to try them! Love all the fresh berries you added. And also that you used coconut milk. Delicious! Ooooo – Blueberries and coconut! I’ve never had that combination before – especially in pancakes! What a great idea – looks delicious! I don’t know how I missed these earlier, but WOW Julie! Coconut and blueberry and pancakes!? That is some delicious stuff right there! What a great recipe! Wow your pancakes inspired me! Never tried adding coconut (one of my favorite things!) in pancakes. Really GREAT idea, Julie! 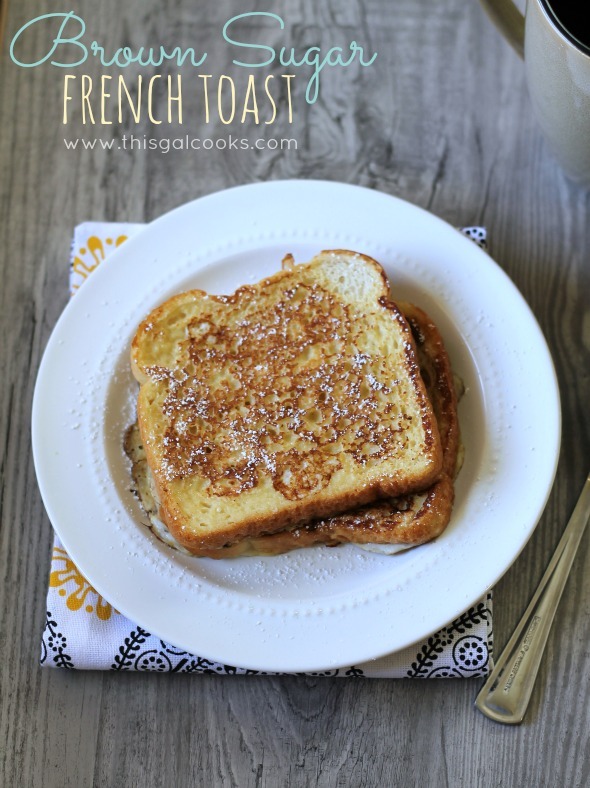 And now I also spotted your delicious brown sugar french toast… that looks so good too! Pinned! Thank you, Nami! I really enjoyed them with coconut milk. They are a little denser than pancakes made with regular milk. I’d compare the consistency to that of Buttermilk pancakes. These look delicious! I would’ve never thought to put them together, but i can imagine eating them now! YUM! 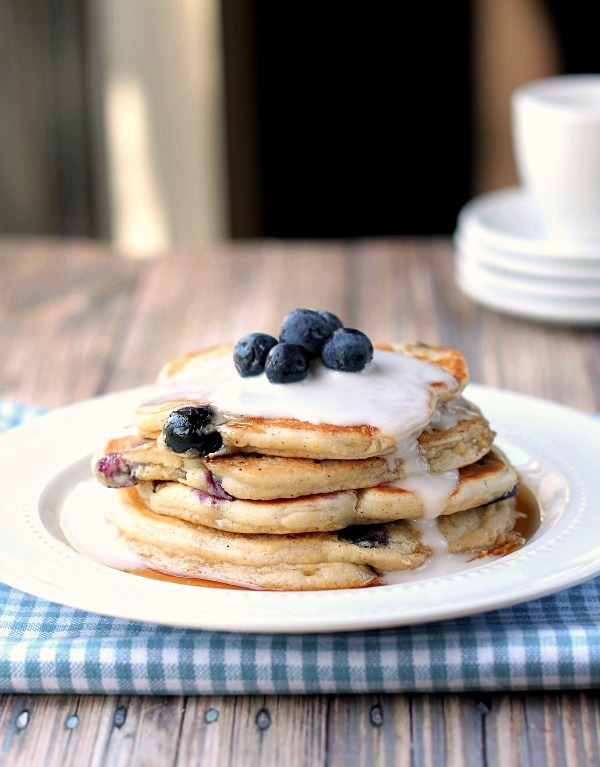 PS…these pancakes rock with the coconut and blueberry together! 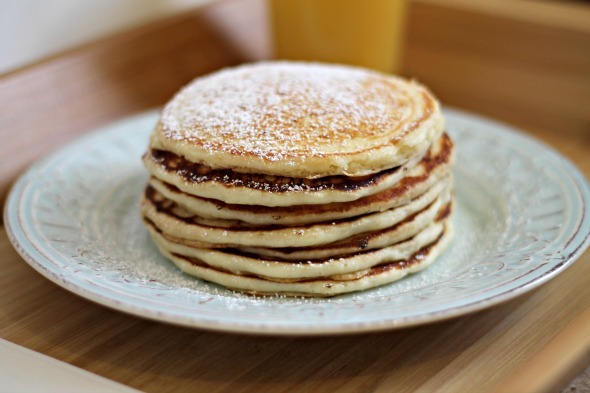 Pinned the biggest pic onto my pancakes board…yum! And you have the mountains too, right? I bet that is awesome! We just have flat land here. Well, some really small hills but they are small. Ha! And we have the landfills that are really tall. grass is put over them to try to make them look nice. I know, silly, right? But I guess it’s better than looking at garbage! I call them the mountains of Florida. You always see them in desolate areas…or along the side of the interstate. Thank you for stopping by, Gloria! And thanks for the pin! Aww well thank you, Stacy! :) Have a wonderful day! I have blueberries… I have coconut… Thinking about breakfast for tomorrow. Found you over at Cast Party Wednesday. I am co-hosting Tasty Tuesdays this week and would love for you to link up this recipe.